This is truly a seminal piece. This rusty lantern I bought in an antique shop for not much money and it sat on the wood stove in my apartment long before I started doing art. 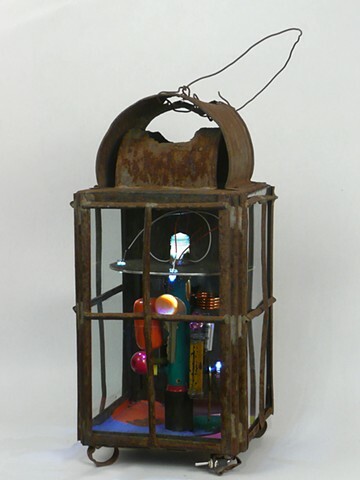 After I had created a few pieces, I looked at that lantern in a different way. The lantern, of course, was frightened. It had seen what I'd done to other perfectly nice junk in the name of art. But I just assembled some old colorful electronic parts around a cardboard tube in the middle and mounted some LEDs in a disk above them. Simple, colorful. Jan won't let me sell it. And I don't think the lantern is unhappy either.